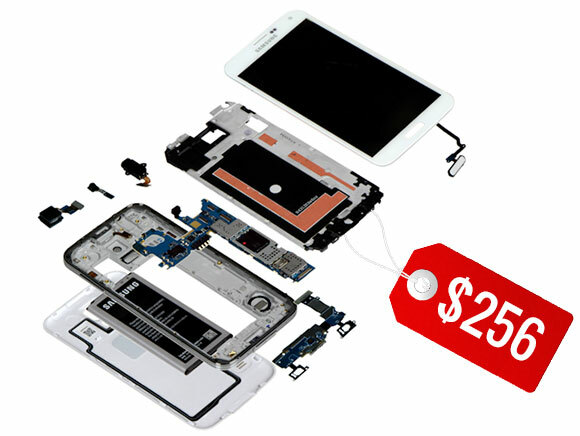 Analytics company IHS has released its teardown report of the Samsung Galaxy S5, which also reveals an estimate of the phone's bill of materials (how much its parts cost). The Galaxy S5 costs Samsung about $256 to build, which is just slightly more than what the Galaxy S4 cost back in 2013 - $244. Interestingly, according to IHS the fingerprint sensor in the Galaxy S5 costs just $4, which is significantly less expensive than the one found in the iPhone 5s. Apple spends $15 for each one they place in their current flagship phone, which carries a $199 bill of materials. Lastly, Galaxy S5's heart rate biosensor is made by chipmaker Maxim and adds $1.45 to the cost of the device. IHS estimates the cost of assembly is $5 per device. Be wary that while this component price estimation gives a neat overview of the phone's cost, it doesn't include R&D, software, distribution and marketing costs.